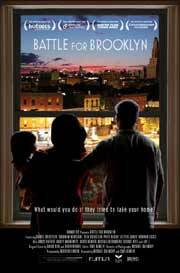 Battle for Brooklyn is a documentary that’s been in production for six years now that chronicles the fight to prevent the controversial Atlantic Yards project from demolishing several Brooklyn neighborhoods. The film is being produced by Rumur Releasing, the multimedia studio run by Michael Galinsky, Suki Hawley and David Bellinson. However, as the film nears completion, it is looking to raise $25,000 before Dec. 1 through the fundraising site Kickstarter. Rumur hopes to fund the rest of the film by pre-selling DVDs of the documentary. If you go to the Battle for Brooklyn page on Kickstarter, you’ll find different donation levels that will earn you a copy of the film and other swag. As production on the film comes to an end, the Atlantic Yards project is also nearing a critical juncture. The film focuses mostly on the story of Daniel Goldstein, a young husband and father, who refuses to sell his home to the developer and is now being threatened by an eminent domain seizure by the State of New York. Daniel continues his fight and, according to the Battle for Brooklyn page on Kickstarter, if the developer doesn’t get their shovels in the ground by Dec. 31, then it’s most likely that the project will not be built. If you’re interested, you can also have input in the editing and production of the film. Between now and Dec. 1, Rumur will be posting a video clip from the film that you can comment and give suggestions on. Several months ago, I was lucky enough to watch a rough edit from a portion of the film and it looks to be an exciting and engaging documentary that does address both sides of the issue. Is a development like Atlantic Yards beneficial to the city and its residents? Or does it come at too high a cost of displacing families and changing the landscape of a neighborhood? I’ve also received and reviewed several of Rumur’s previous documentary offerings, such as Horns and Halos and Occupation: Dreamland. So, I am a fan of theirs, which is why I’m posting about their plea here. I also don’t know too much about Kickstarter, but I’ve been hearing about it quite a lot lately as more filmmakers and film festivals are using the site to raise money. So, if you want to help out some great filmmakers and/or get involved in the process, please visit the Battle of Brooklyn page on Kickstarter.